After nearly 30 years as a devout Protestant, I decided in February 2018, after nearly a year of in-depth study, to become Catholic. I am set to be received into the Catholic Church at the 2019 Easter Vigil. While I was consciously investigating Catholicism the year before making the decision, the reality is that I had had many issues with protestantism for many years (protestantism provides no basis for Christian unity beyond an abstraction—which is one of the problems I had with it, its fundamental lack of unity—so I am referring in general to theological doctrines that belong to one or more protestant sects). Thus, my year of consciously studying Catholicism actually turned out to be a year in which I discovered all the issues I had had with protestantism for so long had an answer, and that answer was the teaching of the Catholic Church. So I’ve decided that I will be doing a large, multi-part series of blogs which show some of the reasons I decided to convert. I feel the need to explain myself, as well as the desire to share my unspeakable joy at becoming Catholic. The journey was in-depth, and so will these blogs—but in bite-size pieces, so as many people can follow along and digest it as possible. I purchased literally hundreds of books in the process of studying Catholicism, and so many of the quotes and points made in those books will be included on these blog posts. I have no idea how many posts will be included, so I’ve simply entitled this first one “Becoming Catholic #1.” As you probably guessed, I’ll simply increase the number as we go along, with a short summary of the topic being discussed. A big reason why I am writing these posts is not only to explain, in depth, the reasons for my conversion, but also provide good resources for people who simply don’t have the time or willingness to do the sort of in-depth study I have done. 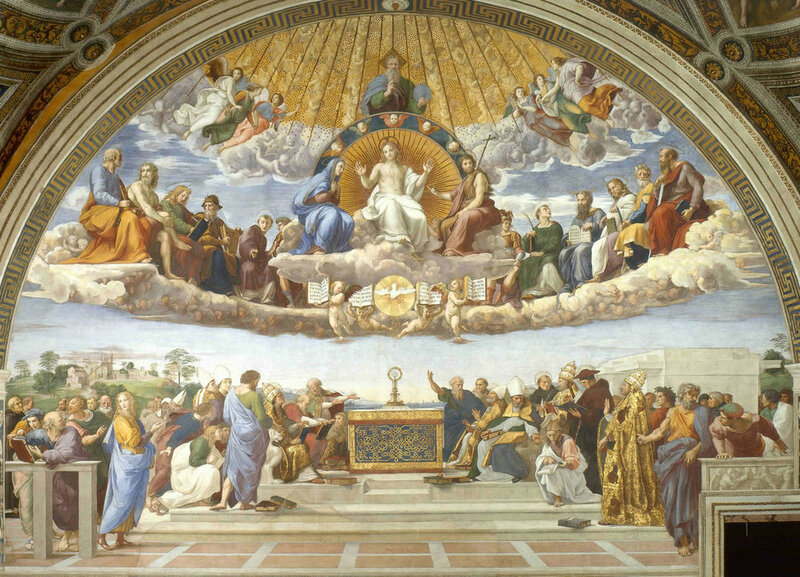 This post is about an incredibly important topic: the Real Presence of Christ in the Eucharist, according to the Church Fathers. Indeed, this was the initial “red pill” I consumed when I opened the first volume of the Apostolic Fathers. These were the earliest Church Fathers, some of whom knew the Apostles themselves—hence their categorization as the “Apostolic Fathers. You can purchase the 38 volume set this came from here. You can also access many of the salient writings of the Church Fathers (including those in the 38 volume set) online, for free, at New Advent, and the Ethereal Library of Christian Classics. So without further ado, here is a good sample of the quotes from the Church Fathers on the Real Presence of Christ in the Eucharist that blew me away. This is not complete, but you will quickly see that the understanding of the Church Fathers on this point was thoroughly Catholic. Of particular importance: these Fathers are from both West and East. This is not a “Roman” invention. The Orthodox hold the same basic doctrine, along with Catholics, to this very day. 22 On the next day the people who remained on the other side of the sea saw that there had been only one boat there, and that Jesus had not entered the boat with his disciples, but that his disciples had gone away alone. 23 However, boats from Tiberias came near the place where they ate the bread after the Lord had given thanks. 24 So when the people saw that Jesus was not there, nor his disciples, they themselves got into the boats and went to Capernaum, seeking Jesus. 52 The Jews then disputed among themselves, saying, “How can this man give us his flesh to eat?” 53 So Jesus said to them, “Truly, truly, I say to you, unless you eat the flesh of the Son of man and drink his blood, you have no life in you; 54 he who eats my flesh and drinks my blood has eternal life, and I will raise him up at the last day. 55 For my flesh is food indeed, and my blood is drink indeed. 56 He who eats my flesh and drinks my blood abides in me, and I in him. 57 As the living Father sent me, and I live because of the Father, so he who eats me will live because of me. 58 This is the bread which came down from heaven, not such as the fathers ate and died; he who eats this bread will live forever.” 59 This he said in the synagogue, as he taught at Capernaum. 66 After this many of his disciples drew back and no longer went about with him. 67 Jesus said to the twelve, “Will you also go away?” 68 Simon Peter answered him, “Lord, to whom shall we go? You have the words of eternal life; 69 and we have believed, and have come to know, that you are the Holy One of God.” 70 Jesus answered them, “Did I not choose you, the twelve, and one of you is a devil?” 71 He spoke of Judas the son of Simon Iscariot, for he, one of the twelve, was to betray him. Take note of those who hold heterodox opinions on the grace of Jesus Christ, which have come to us, and see how contrary their opinions are to the mind of God…They abstain from the Eucharist and from prayer because they do not confess that the Eucharist is the flesh of our Savior Jesus Christ, flesh that suffered for our sins and that the Father, in his goodness, raised up again. They who deny the gift of God are perishing in their disputes. We call this food Eucharist, and no one else is permitted to partake of it, except one who believes our teaching to be true and who has been washed in the washing that is for the remission of sins and for regeneration [i.e. baptism] and is thereby living as Christ enjoined. For not as common bread nor common drink do we receive these; but since Jesus Christ our Savior was made incarnate by the word of God and had both flesh and blood for our salvation, so too, as we have been taught, the food that has been made into the Eucharist by the eucharistic prayer set down by him, and by the change of which our blood and flesh is nurtured, is both the flesh and the blood of that incarnated Jesus. If the Lord were from other than the Father, how could he rightly take bread, which is of the same creation as our own, and confess it to be his body and affirm that the mixture in the cup is his blood? He has declared the cup, a part of creation, to be his own blood, from which he causes our blood to flow; and the bread, a part of creation, he has established as his own body, from which he gives increase to our bodies. When the mixed cup [wine and water] and the baked bread receive the Word of God and become the Eucharist, the body of Christ, and from these the substance of our flesh is increased and supported, how can they say that the flesh is not capable of receiving the gift of God, which is eternal life—flesh that is nourished by the body and blood of the Lord, and is in fact a member of him? “Eat my flesh,” [Jesus] says, “and drink my blood.” The Lord supplies us with these intimate nutrients, he delivers over his flesh and pours out his blood, and nothing is lacking for the growth of his children. [T]here is not a soul that can at all procure salvation, except it believe while it is in the flesh, so true is it that the flesh is the very condition on which salvation hinges. And since the soul is, in consequence of its salvation, chosen to the service of God, it is the flesh that actually renders it capable of such service. The flesh, indeed, is washed [in baptism], that the soul may be cleansed…The flesh is shadowed with the imposition of hands [in confirmation], that the soul may be illuminated by the Spirit; the flesh feeds [in the Eucharist] on the body and blood of Christ, that the soul may fatten on its God. “And she has furnished her table”: That denotes the promised knowledge of the Holy Trinity; it also refers to his honored and undefiled body and blood, which day by day are administered and offered sacrificially at the spiritual divine table, as a memorial of that first and ever-memorable table of the spiritual divine supper. [Paul] threatens, moreover, the stubborn and forward, and denounces them, saying, “Whosoever eats the bread or drinks the cup of the Lord unworthily, is guilty of the body and the blood of the Lord.” [1 Cor. 11:27] All these warnings being scorned and despised, [lapsed Christians will often take Communion] before their sin is expiated, before confession has been made of their crime, before their conscience has been purged by sacrifice and by the hand of the priest, before the offense of an angry and threatening Lord has been appeased, [and so] violence is done to his body and blood; and they sin against their Lord more with their hand and mouth than when they denied their Lord. And we ask that this bread [“our daily bread” in the Lord's Prayer] should be given to us daily, that we who are in Christ, and daily receive the Eucharist for the food of salvation, may not by the interposition of some heinous sin be separated from Christ's body by being withheld from communicating and prevented from partaking of the heavenly bread. It has come to the knowledge of the holy and great synod that, in some districts and cities, the deacons administer the Eucharist to the presbyters [i.e. priests], though neither canon nor custom permits that they who have no right to offer [the Eucharistic sacrifice] should give the body of Christ to them that do offer [it]. After having spoken thus [at the Last Supper], the Lord rose up from the place where he had made the Passover and had given his body as food and his blood as drink, and he went with his disciples to the place where he was to be arrested. But he ate of his own body and drank of his own blood, while he was pondering on the dead. With his own hands the Lord presented his own body to be eaten, and before he was crucified he gave his blood as drink. [A]s the bread and wine of the Eucharist before the invocation of the Trinity, which is holy and worthy of adoration, were simply bread and wine, and after the invocation the bread becomes the body of Christ, and the wine the blood of Christ. Rightly then do we believe that now also the bread which is consecrated by the Word of God is changed into the Body of God the Word...consecrated by the inhabitation of the Word that tabernacled in the flesh…Since, then, that God-containing flesh partook for its substance and support of this particular nourishment, also [bread], and since the God who was manifested infused Himself into perishable humanity for this purpose, viz. that by this communion with Deity mankind might at the same time be deified, for this end it is that, by dispensation of His grace, He disseminates Himself in every believer through that flesh, whose substance comes from bread and wine, blending Himself with the bodies of believers, to secure that, by this union with the immortal, man, too, may be a sharer in incorruption. He gives these gifts by virtue of the benediction through which He trans-elements the natural quality of these visible things to that immortal thing. Perhaps you may be saying, “I see something else; how can you assure me that I am receiving the body of Christ?” It only remains for us to prove it. And how many are the examples we might use!…For Christ is in that sacrament, because it is the body of Christ. 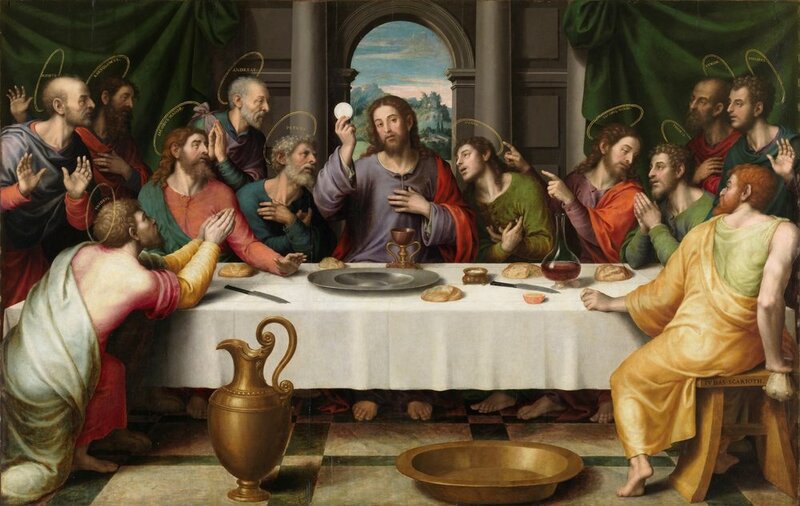 When [Christ] gave the bread he did not say, “This is the symbol of my body,” but, “This is my body.” In the same way, when he gave the cup of his blood he did not say, “This is the symbol of my blood,” but, “This is my blood.” For he wanted us to look upon the [Eucharistic elements] after their reception of grace and the coming of the Holy Spirit not according to their nature, but to receive them as they are, the body and blood of our Lord. We ought…not to see [the elements] merely as bread and cup, but as the body and blood of the Lord, into which they were transformed by the descent of the Holy Spirit. Christ was carried in his own hands when, referring to his own body, he said, “This is my body.” [Matt. 26:26] For he carried that body in his hands. I promised you [new Christians], who have now been baptized, a sermon in which I would explain the sacrament of the Lord’s table…The bread you see on the altar, having been sanctified by the word of God, is the body of Christ. The chalice, or rather, what is in the chalice, having been sanctified by the word of God, is the blood of Christ. What you see in the bread and the chalice; that is what your own eyes report to you. But your faith obliged you to accept that the bread is the body of Christ and the chalice is the blood of Christ. We will necessarily add this also. Proclaiming the death, according to the flesh, of the only-begotten Son of God, that is Jesus Chris, confessing his Resurrection from the dead, and his Ascension into heaven, we offer the unbloody sacrifice in the churches, and so go on to the mystical thanksgivings, and are sanctified, having received his holy flesh and the precious blood of Christ the Savior of us all. And not as common flesh do we receive it; God forbid: nor as of a man sanctified and associated with the Word according to the unity of worth, or as having a divine indwelling, but as truly the life-giving and very flesh of the Word himself. For he is the life according to his nature as God, and when he became united to his flesh, he made it also to be life-giving. [I]f God the Word of His own will became man and the pure and undefiled blood of the holy and ever-Virginal One made His flesh without the aid of seed, can He not then make the bread His body and the wine and water His blood?…For just as God made all that He made by the energy of the Holy Spirit, so also now the energy of the Spirit performs those things that are supernatural and which it is not possible to comprehend unless by faith alone.